Each year, once the teams’ liveries have been rounded up, I’ve meant to do a post about the drivers’ helmets as well, and never got around to it. Well, SHOCK HORROR: for 2011, I’ve finally done it. I’m not as into helmet liveries as I am those of the cars, but nevertheless, I think there’s a fair amount of interest to be found in paying attention to the changing trends, and to the habits that some drivers have of switching designs frequently, or using one-off paint jobs, and so on. Personally, I think helmet designs were at their best between around the 1980s and late 1990s – during that time, just about every driver had a distinctive yet usually simple design. The patterns would be large, and easily reproducible – in comparison to helmet designs in other sports (such as superbikes), they were never needlessly complex or detailed. This meant that there were a wealth of classic and memorable designs (and at some point, I’ll get around to doing another feature on some of my favourites from this era and beyond). Since the turn of the century, however, there’s been more of a shift in fashion towards more elaborate and complex designs – helmets that look terrific in close-up, but from a distance are far less distinguishable against the backdrop of a car. There’s also tended to be a bit less reliance on national identity (in the past, an especially high percentage of drivers’ helmets would be based around their national flag), and a lot of drivers are far less concerned about having a single branded image following them through their career – instead changing their design at the drop of a hat, to please either the demands of teams/sponsors or simply their own whims. It’s an idea that surely seems anathema to fans of the likes of Senna, Hill or Mansell. Of course, Seb Vettel has been the king of ever-changing designs during his short time in F1. The driver most closely identified with the blue and silver “can” design that Red Bull seem to force upon most of their pilots, Vettel has instead frequently taken the opportunity to experiment with the area around the upper and lower rings of the helmet. Happily, however, he appears to have settled – for the moment – on this shiny, swirling design, as seen towards the end of last season, and throughout pre-season testing and in Australia. It’s probably one of the better designs he’s employed, too. Meanwhile, Mark Webber sticks with a variation on his signature design – I like this look, although I’m not sure about the needless jagged edges that were introduced more recently to it. I’m disappointed in Fernando Alonso‘s recent helmet choices, as I think he had a brilliant, consistent design for his first few years in F1. The mixture of the Spanish flag and the light blue (switched to for the sake of Mild Seven sponsorship, but kept even after they left Renault) worked really well, but after moving to McLaren he ditched the design for one that matched the car – and although he’s gone back to assorted variants on it since, none have really worked. His current Ferrari version is at least significantly better than the mostly-red 2009 effort, but it still doesn’t really seem sure what it wants to be any more – there’s too much going on. Felipe Massa, by contrast, has stuck pretty rigidly to a two-colour scheme for his entire F1 career – it’s evolved, but not hugely, and is still recognisably his. Even though the more curved current version does look a bit like he’s being attacked by a radioactive octopus. Incidentally, it’s interesting to note that for this year, Ferrari have finally dropped the white stripe around the top that previously signified the Marlboro sponsorship – it makes the team’s lids look somewhat less distinctively “theirs”. I can understand why a superstitious Michael Schumacher would favour using a red helmet – he didn’t start winning titles for Ferrari until he changed the white portion to red in 2000 – but I still greatly prefer the old design, with the German flag and the white upper and lower rings. Even the version that was red, but still had the flag in it, was better than this all-red thing – which just looks odd in the silver Mercedes, and even worse with the black “Monster” panels on it. Nico Rosberg, meanwhile, has a nice, straightforward and distinctive design – although I’m not sure I didn’t prefer it when the grey section was blue, as in his Williams days. That said, one thing you can say in Mercedes’ favour is that it’s impossible to get the two drivers mixed up when looking at the car from a distance! I’m pretty sure Nick Heidfeld changes his helmet design more frequently than I change my socks. Anyway, for his fill-in stint at Renault, he’s team-matched – a practice I don’t really approve of, but it does make for a nice-looking design in this instance (and fortuitously gives him a somewhat German colour scheme). Though I think it’d be better if his “Q” design was gold on both sides, rather than red on one. Meanwhile, Vitaly Petrov has a nice, clean and simple design – and it’s flag-based, to boot. Excellent work. In a way, it’s almost good that Rubens Barrichello is at a team who won’t sully his helmet with colourful sponsor logos – it is, after all, the longest-serving design in the sport (and in terms of race starts, in the sport’s history), and although it’s a little dull, it’s a pleasing reminder of a simpler time. Pastor Maldonado, meanwhile, earns points for using his country’s flag – but otherwise his design is somewhat forgettable. I like Adrian Sutil‘s design quite a lot – although it could stand to have a bit more of the burgundy in place of some of the silver. What’s odd is that it looks like it’s been designed to go with his team’s test livery from 2007 – something they’ve long since dropped in favour of white, orange and green. Nevertheless, it’s a pretty smart job – unlike Paul di Resta, whose design isn’t really one thing or another, simply a mess of clashing bright colours in a nondescript pattern. Poor. I do like the colour scheme of Kamui Kobayashi‘s helmet a lot, even though I think the design itself is a little busy. The pattern in the main red circle is smart, though. It’s good to see Sergio Perez employing the Mexican flag colours in his design – although the chosen shades are a little bright for me. It’ll at least make him stand out of that dull car, but I think it could be a bit smarter. Another driver who’s had to defer heavily to the Red Bull “can” design, Sebastien Buemi has at least managed to give it a bit of individuality with the Swiss flag red section on the top – even though it does make it look a little like he should be driving the medical car instead! Meanwhile, Jaime Alguersuari has a slightly nondescript design, but the Spanish colours fit in well with Red Bull’s own look – and I like the way the pattern implies an extension of the “sun” design. Not bad, but not hugely memorable. I preferred Heikki Kovalainen‘s design when it was red, rather than this bright green – his having switched to that colour upon joining Lotus doesn’t even really make sense when you consider how different a shade it is from that of the car. It’s also one of those modern, slightly random designs that isn’t really very memorable or iconic. Jarno Trulli, meanwhile, is on his third major helmet design – having started with a very ’90s-style white helmet that featured red and green strips, he then switched to a mostly-chrome design at Toyota, before settling on a shiny red effort that evoked his original design while updating it. This design did look better in his late Toyota years, though – at Lotus it’s a more orangey-red, and doesn’t really look as classic. He’s also another driver, along with Jenson Button, employing a stylised version of his initials on the side – but which is only legible as such on the left-hand side! An underwhelming set of designs at HRT – Narain Karthikeyan has a simple and straightforward Indian flag design, but it’s a little dull (and seems like it’d be better suited to racing in the Force India livery) – while Vitantonio Liuzzi has inexplicably made a flat grey the background colour of his otherwise pretty cool asymmetrical red/green helmet. It looked significantly better in both the blue of Toro Rosso and the white of Force India, and I’ve got no idea why he’s changed it now – it simply doesn’t work. A pretty nondescript design for Timo Glock – orange, white and black go nicely together as a colour scheme, but the jagged and unfocused lines of it means it feels like a couple of different designs splattered together, while the German flag has no real reason to be there and feels slapped on. But top, top marks for Jerome d’Ambrosio – a terrific design that manages to look really smart, make use of his country’s flag colours, be instantly recognisable, and feel like a classic ’80s/’90s-style design (in fact, it looked so familiar I had to check it hadn’t already been used by another driver in the past). The only real criticism is that these two drivers, employing similar colour schemes, will be quite difficult to tell apart – but that’s still a lovely design no matter which way you look at it. So those are my thoughts – what do you folks reckon? Which are your favourites? And which are the duds? Hamilton’s- If any of the current helmets are to be remembered in 20 years time, it will almost surely be Hamiltons. Very colourful, easy to identify, nice design… I think it’ll prove to be iconic. Alguersuari’s- One of the few helmets which I rate differently to the article. I think it’s great, those jagged yellow lines are really striking. I think perhaps it seems a bit nodescript because Alguersuari is so anonymous, if a front runner like Alonso used it I reckon it’d be much more popular. d’Ambrosio’s- It’s only just struck me how cool this helmet is! Very retro, and I think black, red and yellow always look good together. Schumacher’s- OK, so it’s a bit dull, and the Monster box ruins it a bit. But I just love how much it stands out, it almost transforms the entire livery of the car. In a red car, it’d look boring. Barrichello’s- More for the longevity factor than anything else. I love the helmet is almost identical to the one he used back in his Jordan days all those years ago. Kudos to him for sticking with for so long! Button – Looked great last year and i agree that the pointy letters kinda ruin it now. Rosberg – I feel like a non-matte grey or a shiny silver would make that helmet top class. The matte grey kind ruins it for me. Petrov – I like the fact he’s used the flag, but it’s not a very good design. 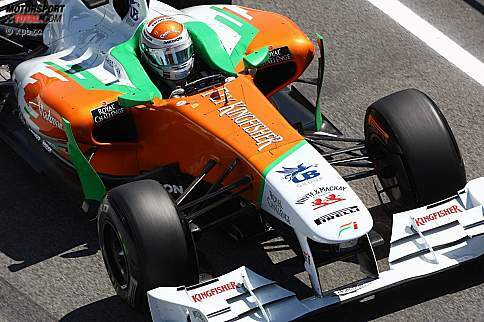 Sutil – The colours don’t work for me, just looks dull. Kovalainen – I think especially in 2007, his helmet looked inspired by JJ Lehto. It still has an aspect of that but not as much. Trulli – Looked better with the shiny red but in the dark Lotus it didn’t work so the switch to the bright orange made sense. Liuzzi – The grey this round is actually sparkly. Looks terrible. Was one of my favourites when the grey was white. D’Ambrosio – Really like this one. I’m a fan of clean and simple. The helmet of Jerome d’Ambrosio have the same colour scheme of Stefan Bellof, for me the most brilliant paint job of a helmet in formula 1. Ah, that’s nice to know. I guess he also uses the colours of the Belgian flag in his design too. A really great design I think. The helmet article, I’ve found it! Very nice writeup, great to see it appear. I agree that the Schumacher helmet has been better; but it is interesting that in this case, without really major impact on their drivers original design (who knows why Schumacher changed it, maybe he didn’t want to stress how many Germans F1 now has thanks to him :-p ), the team still managed to get the drivers to fit their car: not by fitting with the chrome/silver turquoise (that would be really hard to do while still keeping them distinct and nice! ), but by having both quite brightly contrasting helmet designs (and I suppose they joked a bit with Schumacher for wanting their first car, and hence the orange/reddish camera pod) that fit very well. The moment I saw d’Ambrosio’s design, I loved it, very well done, simple and clear, with the Belgian colours in it as well. I agree with Ned that Hamiltons design will likely be remembered well, because of its history, his results, and the design itself. I really liked to see a bit more of the Spanish flag back on Alonso, and I wonder in how far the colours of Massa’s design are derived from the Brazilian flag, it seems there’s some of that there. By the way, when I first saw the change Liuzzi had made, I thought he matched the boring grey of the 2010 HRT car, while even they managed to get of it for this year! I’m not saying that everyone needs to use the team’s colours on his helmet – but Sutil ditched his own colours for the team’s test colours in late 2007 – and stuck with it for more than 3 years, despite the team using a new colour scheme at least since 2009. I would like to see you doing one for the 2015 helmets, as the 2014 season is over.